AIDAmar, the next ship under construction for Carnival Corp's AIDA brand, is ten months away from delivery by Meyer Werft. Last week the ship's four giant engines arrived by boat at the Papenburg yard. AIDAmar, at this point doesn't look much like a ship, but a crane lifted them into place where they will go in the hull, and the ship will be built around them. This video from AIDA shows the installation process which took only six hours. Each of the 127-ton engines has nine cylinders and will generate 1,000 kilowatts of power that will be used for propulsion and electricity aboard the ship. AIDAmar is scheduled to enter service on May 12, 2012. Carnival Corp began construction of a new Welcome Center in Cockburn Town on Grand Turk to complement the Grand Turk Cruise Center which they opened in 2006 and is responsible for bringing nearly 640,000 passengers to the island annually. 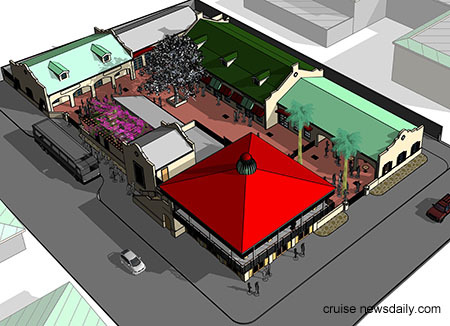 The new Welcome Center is designed to draw people into town (from the Cruise Center). The complex, located at the southeast corner of Front and Market streets, will include a tourist information office, restaurant/lounge, and shopping. Shown in the artist's renderings below, its architectural style is patterned after the area's existing architecture. The new complex is slated to open by the end of 2011.